Stir in salsa, tomato sauce and water. Heat to boiling. Stir in macaroni and corn. 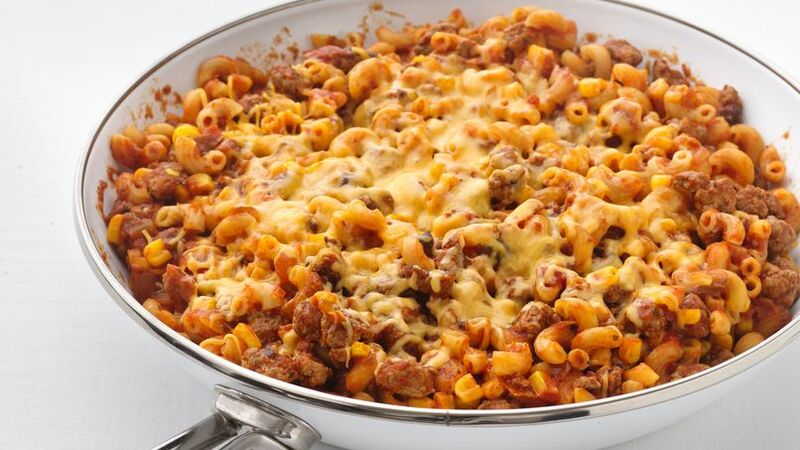 Reduce heat; cover and simmer 12 to 15 minutes, stirring occasionally, until macaroni is tender. Sprinkle with cheese. Cover; let stand 1 to 2 minutes or until cheese is melted. We've replaced ingredients with great-tasting alternatives to create better-for-you recipes that are just as yummy as the original. Lean ground turkey can be used instead of the ground beef, if you like. Toss a crisp green salad with your favorite low-fat dressing and serve it with this family-style skillet meal. Fresh fruit makes a perfect dessert. 72% less sat fat • 68% less fat • 26% fewer calories than the original recipe. This 30-minute sizzling skillet will have your family running to the table!